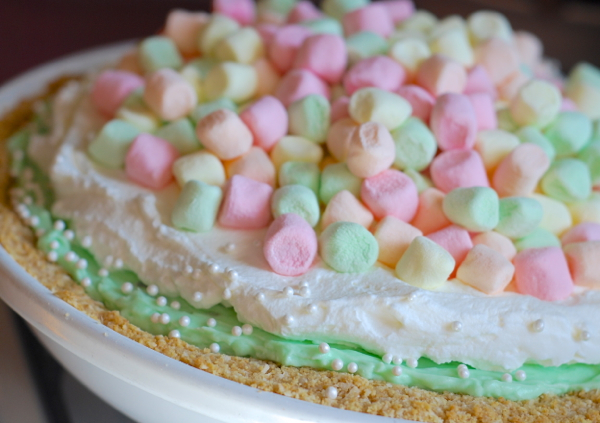 Ever since the first time I saw the movie Waitress I’ve wanted to make this pretty, dreamy, Marshmallow Mermaid Pie. It’s so sweet and colorful, but honestly, I fell in love with the name. 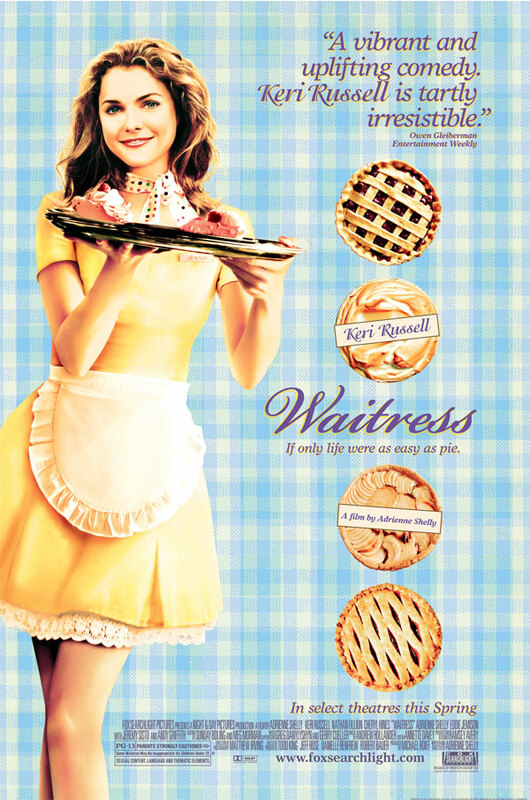 Here’s my interpretation of the pie that Jenna presents to her doctor. 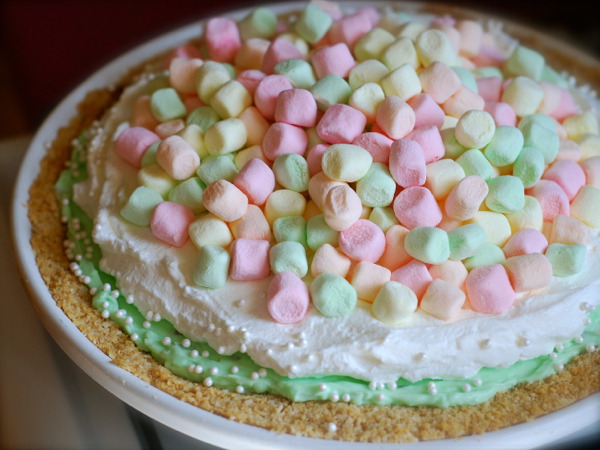 It’s actually very easy to prepare, and would make a perfect Easter dessert, or treat for a springtime gathering. Place all crust ingredients in the bowl of a food processor. Pulse until fine crumbs form and are sticking together. Transfer to a deep dish, glass pie plate and press firmly into bottom and up sides of pan. Bake in preheated oven to 8 to 10 minutes, or until fragrant and light golden brown. Cool crust completely before filling. 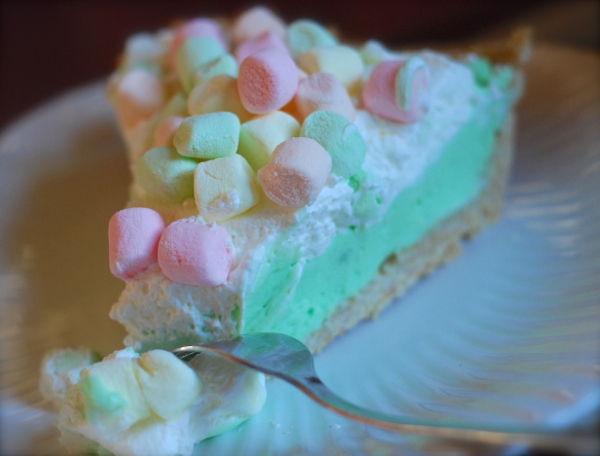 To speed up the process, place cooling crust in freezer while you make the filling. Place all ingredients for pistachio mousse filling in the bowl of a counter top mixer (such as a Kitchen Aid.) Using the whisk attachment, mix on low just to combine ingredients, and then turn on medium high for about 2 minutes, until filling is light and fluffy. Spread into completely cooled crust. Wash bowl and whisk. Dry thoroughly. Place all coconut cream topping ingredients in the mixer bowl. Using whisk attachment, whip until light and fluffy and stiff peaks form. Spread this over the pistachio mousse filling. 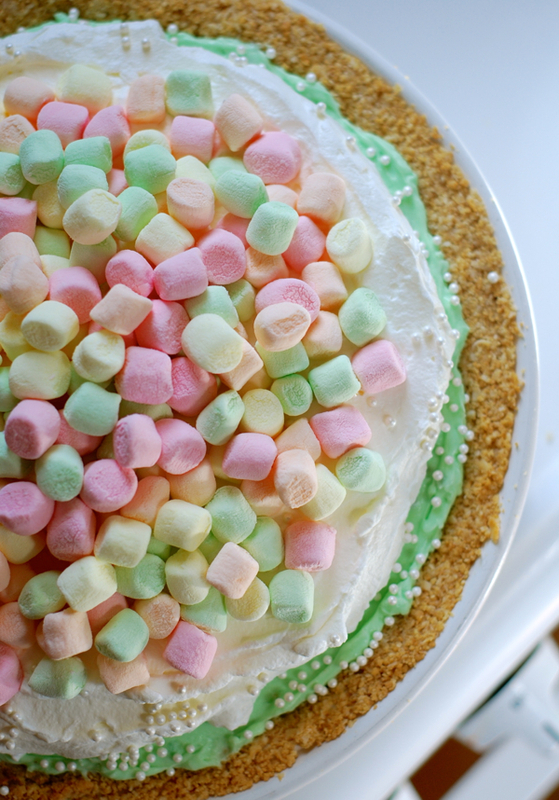 Sprinkle with white pearl sprinkles, and top with multicolored pastel mini marshmallows. Place in refrigerator and chill until ready to serve. What are white pearl sprinkles? They’re little candy sprinkles that look like mini pearls. You can usually find them by the rest of the sprinkles down the baking aisle. Lovely! For the crust …the butter should be melted before combined with the crackers/coconut… then combined?